Started playing tennis aged two, Berankis’ nickname is “Rycka” in his homeland. He speaks Lithuanian, Russian and English. Hobbies include spear fishing, playing pool, watching movies and listening to music. Berankis is the former junior World No. 1 in 2007, when he captured US Open junior title and the Orange Bowl. He trains at IMG Bollettieri Academy and Saddlebrook Tennis Academy in Florida. Coached by Remigijus Balzekas since he was nine years old. Somdev calls Agartala home, but lives and trains in Austin, Texas. Competing on the tour keeps him traveling for approximately 35 weeks a year, affording a few quick trips back home to see family. Somdev finished University with a degree in sociology and turned pro in the summer of 2008. He won his first career title that year at a Futures Tournament in Rochester, New York. His best achievement so far on the ATP World Tour has been reaching the finals of the Chennai Open in 2009, as a wild card entry. He was ranked 202. In August 2010, Somdev cracked the top 100 at number 96, putting Indian tennis back on the world singles map. Soon after, he won the gold in the Men’s Singles event of the XIXth Commonwealth Games in Delhi, 2010, followed by two more gold medals (singles and doubles) at the 2010 Asian Games in Guangzhou, China, setting a new Indian record. Farrukh was born May 22, 1986 and is a tennis player playing on the ITF Futures tour and the ATP Challenger Tour. On April 30, 2007, he reached his highest ATP singles ranking of 173 and is coached by Manuel Gasbarri. Started playing tennis at the age of 7 and his nickname is Ducks. James’ idols growing up were Lleyton Hewitt and Patrick Rafter. Duckworth is currently a member of the Australian Institute of Sport (AIS) tennis program and studying a commerce degree at Deakin University. His hobbies include surfing, table tennis, cricket and hanging with mates. If he wasn’t a tennis player would be a rugby league player for Newcastle Knights (AUS). Interesting fact: his grandmother, Beryl Penrose won the Australian Open singles and doubles in 1955. His goals in tennis are to have a successful career and represent Australia in Davis Cup. Coached by Brent Larkham and his physical trainer is Ian Prangley. His highest ATP singles ranking is World No. 136, which he reached on 7 April 2014. His career high in doubles was World No. 78 in September 2013. He is best known for hitting the fastest serve on record at 163.4 mph (263 km/h) in 2012 at the ATP Challenger in Busan. Began playing at age two. Nicknamed “Harry”. In 2005, family moved to Texas and his dad became head pro at John Newcombe’s Tennis Academy in New Braunfels where he now trains. Reached a career-high No. 7 in world junior rankings in April 2008. Advanced to semi-finals at Australian Open juniors in ’08. Held Ryan Harrison Invitational in November 2012 and raised money for Wounded Warrior Project. Trains in Boca Raton, Florida, with USTA Player Development. Started playing tennis aged five. Nickname is “Jazz”. Jaziri speaks Spanish, French, English and Arabic. Member of the 1998 African 14 & Under ITF Touring Team, funded by the Grand Slam Development Fund, that travelled to Europe. Trained in Barcelona for two years. Idol growing up was Pete Sampras. Hobbies include football, movies, music and golf. He was the 2013Intercollegiate Tennis Association (ITA) National Player of the Year and male ACC Athlete of the Year after earning the national championships in indoor singles, outdoor doubles and team competition while also finishing runner up in outdoor singles. He was the first Atlantic Coast Conference athlete to win ACC athlete of the year solely for tennis accomplishments. Began playing tennis at age 11. Plays with a double-handed backhand. Father, Dennis, and mother, Nancy, who played tennis at Iowa. His favorite surface to play on is grass courts. Played for the United States in 2006 Junior Davis Cup. Ranked No. 1 in USTA under-18 boys singles and doubles rankings and won NCAA singles in 2010. Hobbies include golf and basketball. Coached by Lee Merry. Born in Kiev, Ukraine and came over on his first birthday to Fairfax, VA. with parents. Father is a housing architect and his mother is a housewife. He has one older brother, Nikita, who is a student at University of Maryland. Denis began playing tennis at age seven and went to academy in Burke, Va. where he was coached by Frank Salazar. At age 13, moved to Arlington, Va. where he now spends part of the year along with Boca Raton, FL. where he trains. Was home-schooled since ninth grade and at age 16 was interested in attending University of Southern California but decided to turn pro. Won Orange Bowl 16s title in 2009 and turned pro afterwards. Reached final at US Open Jrs in 2010, losing to countryman Jack Sock. Considers hard courts as a favorite surface. Coached by former ATP pro and USTA Player Development Coach Diego Moyano since November 2010. Started playing tennis at age six when his father took him to the local courts. Mother, Julia is a computer analyst; father, Yuri, is a tennis coach. His grandfather was a Ukranian handball champion. He collects baseketball cards. If he wasn’t a tennis player he would like to be a golfer. Growing up, admired Marat Safin. 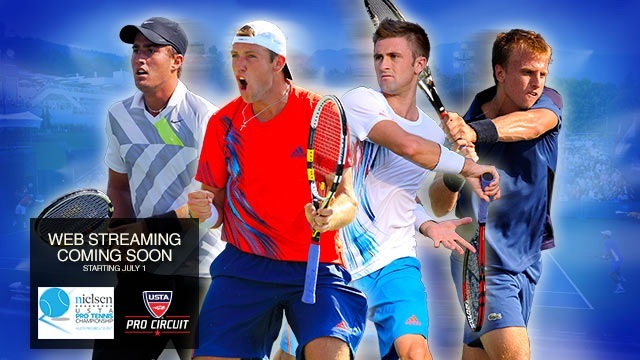 Earlier this year, won the USTA Pro Circuit Wild Card Challenge for Roland Garros entry. Began playing tennis at age seven. Father, Vassili and mother Anna are both engineers. Has one older brother, Igor, a manager and former ice skater who took part in the 1998 Nagano Winter Olympics. Admired Lleyton Hewitt growing up and now Roger Federer. Favourite surface is hard and best shot is his backhand. Likes computer games, music (rock) and movies (Bruce Willis). Speaks English, Irish and some Spanish. Started playing tennis aged seven at Castleknock LTC. Educated at Belvedere College in Dublin and North Carolina State (2006-2008). If he wasn’t a tennis player, he would be “a fireman, so I could save people’s lives”. Idols growing up were Andre Agassi, Pete Sampras and Michael Jordan (basketball). Supports Manchester United FC. Hobbies include writing my tennis blog, reading autobiographies, psychology, spirituality, U2, electronic music and movies. Trains at BTT Tennis Academy in Barcelona and in Vancouver. Nickname is “Mol”. Started playing tennis aged seven in Chisinau with a group of 15 children. Speaks English, Romanian, Italian and Russian. Studied physical education at university in Kiev. Idol growing up was Marcelo Rios. Hobbies include listening to music, football and going out with friends. Trains in Kiev, after attending “many academies” in Italy, Spain and the United States. Began playing at age four. Father, Raghav, is a botnist; mother, Sushma, is a scientific technician. As a junior, won three US national singles events and seven US national doubles events. Then went on to play at Carmel (Indiana) High School, earning All-State honors and became state singles champion. Reached Wimbledon junior doubles final (w/Brian Baker) in 2002. Played one season at Univ. of Illinois and helped team to a 32-0 season in 2003 and NCAA team title. Also won NCAA doubles title (w/Brian Wilson). Started playing tennis at age 6 because his family had an old asphalt tennis court in their backyard. Was offered a scholarship to the Nick Bollettieri Academy in Florida when he was 15. Boarded at the Academy for 2 years so that he could complete year 12 via online education while training. Reached the 2008 Junior Wimbledon Championships doubles final alongside compatriot, Bernard Tomic. Won his maiden ITF Futures Pro Circuit event, the 2009 U.S.A. F19 in Godfrey, Illinois. Claimed three more ITF Futures titles in 2011, in Serbia, Romania, and Australia, breaking into the World’s Top 300 for the first time. Tennis heroes are Pat Rafter, because of his modesty and sportsmanship. Also Lleyton Hewitt for his on-court focus and determination. Favorite tournament is Wimbledon. He has a twin sister and younger brothers and sisters. Hobbies include playing rugby, poker, and surfing. Favorite artists include Chris Brown and Coldplay. He loves sushi. Began playing tennis at age 5 with his father, George, a member of Univ. of Michigan’s Big 10 Conference championship team in 1965. Nicknames include “Muscles,” “Wheels,” and “Iron Mike”. Grew up in Michigan and graduated as Valedictorian at Saddlebrook (Fla.) High School. As a junior, was No.1 in U.S. Boys 18-under in 1996. Favourite food is sushi and Mexican, enjoys working out and favourite places to visit are Hawaii and Necker Island. Wife, Lilly (married Nov. 10, 2007) is a former fitness competitor and currently his physiotherapist…Earned bachelor degree of science in business administration at Univ. of Phoenix while still competing on tour and graduated with 3.94 honours in January 2012. Trains at the Galleria Tennis Athletic Club and Houston Racquet Club. Started playing tennis at the age of 5. Hobbies include sports in general, movies, and relaxing with friends and family. Coached by Des Tyson. Speaks Indonesian and English. Started playing tennis at age 7 with his brother. He likes playing on hast hard-court and favorite shot is his serve. Favorite tournament is the Australian Open. His idol growing up was Ivan Lendl. JP’s hobbies include swimming, rugby and cricket. Supports the New York Yankees and Tom Brady. He also supports Habitat for Humanity which helps build homes for families in need. “J-Man” trains at University of Tennessee, where he played from 2007-2011 and earned two degrees in economics. Was ranked No. 1 in both singles and doubles during his college career. He was one of only two players in NCAA history to be an All-American in singles and doubles with four straight years, and was SEC Athlete of the year in 2011. Born and raised in Wisconsin, now resides in Tampa. Qualified into his first ATP main draw tournament in San Jose by winning eight qualifying matches before losing to Mardy Fish in the first round. He plays the violin and wants to be a lawyer when his tennis career is over.